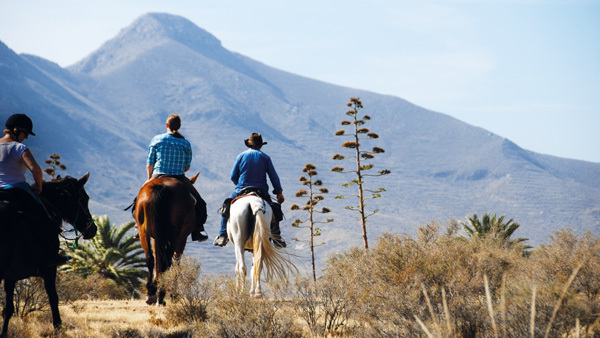 This is the programme for riders looking to explore the Natural Park of Cabo de Gata-Nijar with a knowledgeable guide and excellent horses. The park features virgin beaches, valleys and small fishing villages - all of which you can experience whilst staying in the same comfortable accommodation each night. 6 nights B&B, 4 half days riding (ca 3 hours/day) and one full day riding incl. picnic. Upon arrival, you will be transferred to the hotel in Rodalquilar and will be able to discuss the coming week with your guide. Same accommodation all week. You will ride along the famous beach of El Playazo. With its golden, crystalline sand within a white rugged setting and overlooked by the castle of San Ramon, this is a spectacularly beautiful ride. Cross the interior, full of old mines and climb up through ravines which serve as the only connection to the inland farms. Ride through the crater which forms the Rodalquilar valley and discover mineral walls where the remains of hidden gold can still be found. The mines were operational from 1933 until 1986. Today you will visit quaint villages such as Los Albaricoques, where you will discover the scenery from many Spaghetti Western movies. For those who have watched the likes of "The Good, the Bad and the Ugly" and "A Fistful of Dollars", some of the streets may seem awfully familiar! You will also ride past the "Friar's farmhouse" which inspired the novel "Bodas de Sangre" by Federico Garcia. Today's rid will be an opportunity to visit the great craters of the volcanoes that originally formed the Cabo de Gata National Park. Despite the passing of thousands of years, evidence of the force of these valconic eruptions is still visible today. On the way to Las Negras you ride past vegetable gardens which are irrigated by water flowing from Rambla de las Aguillas and collected in a series of pools near the sea. The village of Las Negras is a simple collection of white houses overlooking the sea. Your return path leads to San Pedro Cala with some impressive ecological sights. After breakfast, you will be transferred back to the airport, bus terminal or train station in Almeria.